Demonstrations over the death of black man Freddie Gray in police custody turned violent on Monday. Rioters hurled rocks at police, but one protester in Baltimore found a peaceful way to rally against injustice, performing Michael Jackson's hit "Beat It." 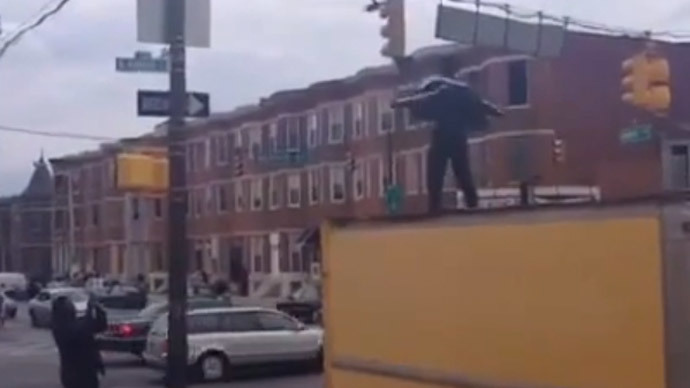 A video posted on social media accounts shows the man dancing to Michael Jackson's hit, with the lyrics: "Just beat it, beat it, beat it, beat it… No one wants to be defeated..."
On April 12, Gray was apprehended by Baltimore Police after fleeing on foot from a group of officers. He suffered a severe injury to his spinal cord while in BPD custody and died a week later. His death sparked large-scale protests in the area.